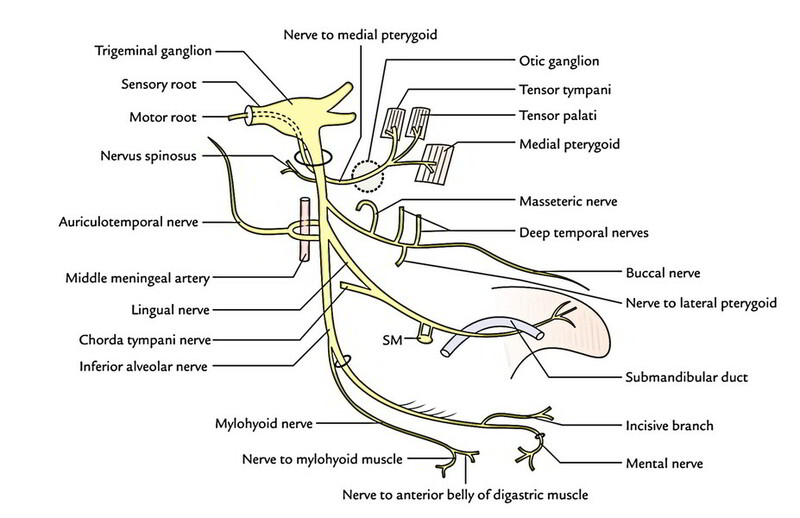 Among the 3 sections of the trigeminal nerve the mandibular nerve is the largest one. Being composed of both sensory and motor fibres, it’s a mixed nerve. It supplies all the structures originated from this arch because it is a nerve of the very first pharyngeal arch, example, muscles of mastication. The origin point is in the middle cranial fossa as 2 roots: a bigger sensory root and a smaller motor root. The large sensory root instantly leaves the cranial cavity by going through foramen ovale to goes into the temple fossa and originates from lateral convex part of the trigeminal ganglion. The small motor root appears from the pons is located deep to the trigeminal ganglion and the sensory root. It also goes through foramen ovale to join the sensory root just below the foramen ovale in the infratemporal fossa, so creating the key trunk. The mandibular nerve trunk is short and after a brief course breaks up into a small anterior and large posterior section. Medial: Tensor palati muscle and otic ganglion. Lateral: Upper head of lateral pterygoid muscle. Anterior: Posterior border of lateral pterygoid plate. Nervus spinosus (meningeal branch): It takes a recurrent course to goes into the cranial cavity via foramen spinosum with middle meningeal artery and supplies the dura mater of the middle cranial fossa. Nerve to medial pterygoid: It originates from the medial aspect of the primary trunk, close to the otic ganglion traverses via the ganglion and supplies the medial pterygoid from its deep aspect. Along with medial pterygoid it also supplies tensor palati and tensor tympani muscles. Masseteric nerve: It appears at the upper border of the lateral pterygoid, just in front of the temporomandibular joint, enters laterally via the mandibular notch, together with masseteric artery to supply the masseter from its deeper aspect. It also supplies the temporomandibular joint. Deep temporal nerves: All these are generally 2 in number, anterior and posterior. The anterior and posterior temporal nerves come at the upper border of the lateral pterygoid and ascend upward in the temporal fossa to supply the temporalis muscle from its deep aspect. Nerve to lateral pterygoid: It runs with all the buccal nerve and enters the deep surfaces of both the heads of lateral pterygoid muscle, which it furnishes. Buccal nerve: It includes all the sensory fibres of the anterior section. It appears between the 2 heads of the lateral pterygoid and classes downwards and forwards onto the buccinator muscle, supplying branches to the skin of the cheek. It then pierces the buccinator muscle and supplies the mucus membrane of the cheek and gum of the lower jaw opposite the molars and second premolar teeth. All the branches of anterior section of the mandibular nerve are motor with the exception of buccal nerve that’s sensory. This nerve originates by 2 roots, which after encircling the middle meningeal artery unify to create the single trunk. It runs backwards between the neck of the mandible and the sphenomandibular ligament. Behind the neck of the mandible, it turns upwards and ascends over the root of zygoma to go into the temple behind the superficial temporal vessels. Its auricular branches supply skin of the tragus, upper part of the pinna, external auditory meatus and tympanic membrane. The lower parts of these regions are supplied by great auricular nerve and auricular branch of the vagus nerve. Its articular branches supplies the temporomandibular joint. Its superficial temporal branches supplies the skin of the temple. It’s the smaller terminal branch of posterior section of the mandibular nerve. It’s sensory to the mucus membrane of anterior two-third of the tongue with the exception of vallate papillae. It starts about 1 cm below the skull. It runs first between tensor palati and lateral pterygoid and after that between medial and lateral pterygoids. About 2 cm below the skull it’s joined by the chorda tympani nerve. After appearing at the lower border of the lateral pterygoid, it first run downwards and forwards between the ramus of the mandible and medial pterygoid comes in direct contact with the entire mandible where the bone is thinned to create a shallow groove below and medial to the final molar tooth, just above the posterior end of the mylohyoid line. This groove divides the attachments of pterygomandibular raphe above and mylohyoid muscle below. It enters the mouth on the superior surface of the mylohyoid and after that it crosses the styloglossus to get to the lateral surface of the hyoglossus. Eventually it is located on the surface of the genioglossus. Here it winds round the submandibular duct (first above, then lateral, afterward below and ultimately medial to the duct) and breaks up into its terminal branches. Carries preganglionic secretomotor fibres to submandibular and sublingual salivary glands. It’s the bigger terminal branch of the posterior section of mandibular nerve. It’s a mixed nerve. It gets all the motor fibres of the trigeminal nerve. It comes below the lower head of the lateral pterygoid and enters vertically downwards and forwards on the medial pterygoid. The nerve is located anterior to inferior alveolar vessels between the sphenomandibular ligament and the ramus of the mandible. Subsequently enters the mandibular foramen in business with inferior alveolar artery, traverses the mandibular canal as far as mental foramen, where it ends by dividing into mental and incisive branches. Nerve to mylohyoid originates from the inferior alveolar nerve before it enters the mandibular canal. It pierces the sphenomandibular ligament to get to the mylohyoid groove. It supplies mylohyoid and anterior belly of digastric muscle. Dental branches supply molar and premolar teeth. Mental nerve comes outside via mental foramen to supply skin of the chin and skin and mucus membrane of the lower lip. Incisive branch, supplies canine and incisor teeth. All the branches of posterior section of the mandibular nerve are sensory with the exception of nerve to mylohyoid that is motor. Inferior alveolar nerve block (typically referred to as inferior alveolar block or 1A block): It’s the most frequently encountered nerve block performed in dentistry to perform dental procedures on the mandibular teeth. The anesthetic agent is injected marginally above the entrance of inferior alveolar nerve into the mandibular foramen being overhung by the lingula. While performing inferior alveolar nerve block, if needle is inserted too far posteriorly, it might go into the parotid gland and damage the facial nerve resulting in transient facial palsy. The lingual nerve is at great risk (10%) during surgical removal of the impacted third molar teeth. The nerve is also at risk during surgical removal of the submandibular salivary gland, during which the submandibular duct must be dissected out thoroughly from the nerve. Referred Pain: It’s the pain often sent from 1 branch of mandibular nerve to the other. Consequently in patients experiencing tongue cancer, the pain radiates to the ear and to the temporal fossa in the area of distribution of auriculo-temporal nerve. The pain is alleviated by splitting the lingual nerve below and behind the last molar tooth. At this site the nerve is in contact with the entire mandible and is covered only by mucus membrane. Likewise, pain from teeth is also referred to the ear and temporal region.